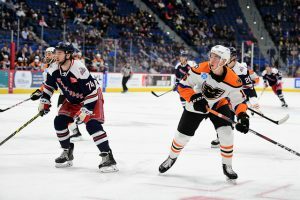 Hartford, Conn. – Justin Bailey impressed in his Phantoms debut with a goal and an assist while Connor Bunnaman extended his goal-streak to three games but the Hartford Wolf Pack had the last goal in a wild, back-and-forth battle to take a 6-5 win in overtime on Friday night at XL Center. Bailey was making his Phantoms debut after being acquired in a trade just the night before in exchange for Taylor Leier who joined the Buffalo Sabres affiliate in Rochester. Bailey also contributed on another goal when he drew a Phantoms power play via his presence at the net-front inducing a high-sticking call that eventually led to a Greg Carey power-play blast for his team-leading 18th of the season. Lehigh Valley (22-15-4) also received valuable contributions from Colin McDonald (4th) who added a three-point night of his own with one goal and two assists while Misha Vorobyev tacked on a couple helpers including a nice drop for Mark Friedman (4th) who opened the scoring just 6:40 into the game. Anthony Stolarz rejoined the Phantoms for the first time in a couple months on a conditioning loan from the Philadelphia Flyers and he turned in a 38-save performance while Hartford cranked up 44 shots for the most the Phantoms have allowed in a game all season. Hartford (19-17-4) was backstopped by former Phantom Dustin Tokarski who won for a second consecutive start against his ex-teammates. Vinni Lettieri (9th, 10th) scored a pair of goals including the overtime winner on a one-time blast from the top of the left circle as part of a 4-on-3 power play. Veteran forward Peter Holland (16th, 17th) had two goals and two assists while John GIlmour cranked out five points on one goal and four helpers. 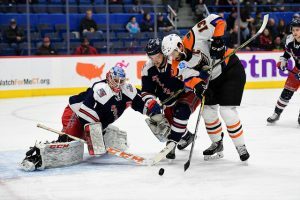 The Phantoms held the lead at 1-0 and 2-1 but Hartford came back to tie the score both times and the teams were deadlocked at 2-2 after twenty minutes. 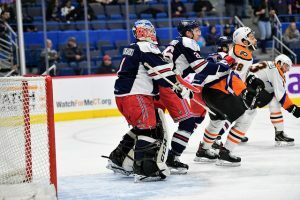 Then it was the Wolf Pack’s turn to take the lead on a power-play goal in the second period by Holland for a 3-2 advantage but this time the Phantoms would surge back for a 3-3 tie and 4-3 lead on goals by Carey and McDonald just nine seconds apart. Hartford equalized again in the closing minute of the middle frame for a 4-4 deadlock after two periods. John Gilmour (11th) blasted through a rebound early in the third period for a 5-4 Hartford advantage before newcomer Justin Bailey would do his thing to tie the game at 5-5 with 5:00 left. He took the puck from down low and sped all the way out to the blue-line barely staying onside before snapping a low, spinner that curled right through and around the legs of some screens by Vorobyev and McDonald and then ultimately through the goalie Tokarski for the tying tally. A double-minor for high sticking late in the game gave Hartford the power play into overtime which Lettieri successfully converted. The Phantom are now 4-2 in overtime decisions and lost in the extra-period for the first time since November 2nd at Binghamton. It was only the second time in the last 38 games in which the league’s top penalty kill had allowed multiple power-play goals in the same game. Hartford out shot the Phantoms 43-28. Lehigh Valley was 2-for-5 on the power play while Hartford was 2-for-2. 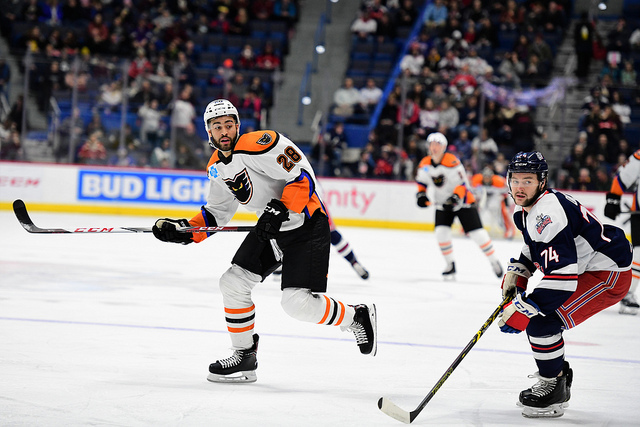 The Phantoms are 1-1-1 vs. the Wolf Pack this season and will rematch on February 9th and 10th in back-to-back games at PPL Center when Hartford visits Center City Allentown for the first time this season. The Phantoms return to PPL Center on Saturday night with a showdown against the North Division leading Rochester Americans on Star Wars Night featurng Star Wars characters and a poster giveaway. Taylor Leier may make his Rochester debut in that game taking on his former team. 1st Period-1, Lehigh Valley, Friedman 4 (Vorobyev, McDonald), 6:40. 2, Hartford, Lettieri 9 (Gilmour, Fontaine), 8:31. 3, Lehigh Valley, Bunnaman 11 (Conner, Myers), 12:57 (PP). 4, Hartford, Holland 16 (Brickley, O’Gara), 17:34. Penalties-Tokarski Hfd (tripping), 12:04; Holland Hfd (slashing), 12:30. 3rd Period-9, Hartford, Gilmour 11 (Butler, Hajek), 6:37. 10, Lehigh Valley, Bailey 10 (McDonald, Willcox), 15:00. Penalties-Vecchione Lv (double minor – high-sticking), 19:18. Referees-Conor O’Donnell (41), Guillaume Labonte (35). NEXT TIME OUT: Lehigh Valley will return to PPL Center on Saturday for STAR WARS NIGHT as they face the Rochester Americans for the first time this season.